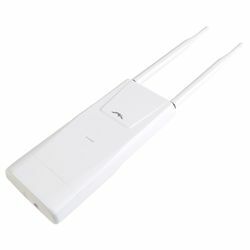 The UniFi AP Outdoor operates in the 2.4 GHz radio band. It can be seamlessly mounted on any wall or pole (mounting kits included). The LED indicator simplifies deployment and configuration. The Unifi AP Outdoor is capable of up to 300Mbps and links of up to 183m (600 ft.) The Unifi Controller software makes it easy to manage your wireless network using a web browser. The durable, weatherproof case withstands outdoor conditions, including wind, rain and snow. Scalable to hundreds of devices while maintaining a single management system. System requirements: Microsoft Windows Vista, Windows 7, Windows 8, or Mac OS X. Includes UniFi Outdoor AP unit, Antennas, 48V PoE adapter and power cord, mounting kit.